Makai Ocean Engineering's Ocean Thermal Energy Conversion (OTEC) Power Plant was connected to the US grid in August 2015. Image: courtesy of Makai Ocean Engineering. The world's biggest operational OTEC plant has an annual power generation capacity of 100kW, which is sufficient to power 120 homes in Hawaii. Image: courtesy of Makai Ocean Engineering. The OTEC plant is located within the Natural Energy Laboratory of Hawaii Authority (NELHA) in Kailua-Kona. Makai's OTEC plant will provide the data to develop offshore OTEC facilities in the near future. Image: courtesy of Makai Ocean Engineering. Makai Ocean Engineering’s ocean thermal energy conversion (OTEC) power plant is the world’s biggest operational facility of its kind, with an annual power generation capacity of 100kW, which is sufficient to power 120 homes in Hawaii. Located at the Natural Energy Laboratory of Hawaii Authority (NELHA) in Kailua-Kona, the facility was connected to the US grid in August 2015 and is capable of providing base load power, meaning it can constantly produce electricity 24h a day throughout the year. The OTEC technology uses the temperature difference between the cold water in the deep sea (5°C) and the warm surface seawater (25°C) to generate clean, renewable electricity. The technology requires a minimum of 20°C (36°F) difference between the surface and deep ocean temperatures. Large amounts of deep cold seawater and warm surface seawater are pumped to run a power cycle to produce electricity. A heat exchanger evaporator generates steam by vapourising an ammonia fluid with warm surface seawater to drive a turbine generator for producing electricity. Once the steam transfers its energy, a heat exchanger condenser further cools the ammonia vapour, turns it back into liquid and conveys it to a heat exchanger evaporator to repeat the cycle. 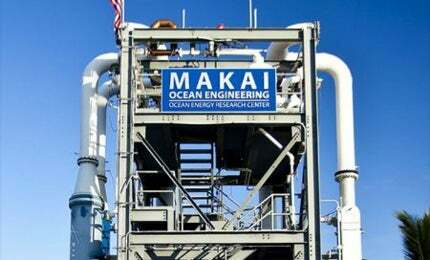 Makai’s OTEC plant forms part of its OTEC heat exchanger test facility and marine corrosion lab, named Ocean Energy Research Center (OERC), located at the NELHA site, which was opened in 2011 following the award of a fund by the US Navy in 2009. The OREC is capable of testing six heat exchangers simultaneously and also conducts research programmes on seawater air-conditioning (SWAC), corrosion prevention and heat exchangers for other marine applications. The research and development works at OERC were funded by the Office of Naval Research (ONR) through the Hawaii Natural Energy Institute (HNEI), whereas the funding for the OTEC plant’s infrastructure was provided by Naval Facilities Engineering Command (NAVFAC). The US Navy’s special engagement in the research centre is driven by its target of generating 50% of its shore-based energy from renewable sources by 2020. The heat exchanger research facility is necessary as their components are estimated to make up approximately one-third of the overall cost in developing a commercial OTEC plant, primarily suited for offshore locations. As of 2014, the research centre completed the test of seven heat exchangers that are constructed of either aluminium or titanium. The US Navy awarded Makai a contract to add a turbine generator to complete the power plant and test the working of OTEC technology on the grid, in 2013. Makai’s OTEC plant is a closed-cycle facility that uses an ammonia fluid to drive the turbine-generator. The two new heat exchangers and the 100kW ammonia turbine-generator were delivered to the project site in late 2014. The turbine generator was placed on top of the 40ft-high OTEC tower within the same year and the testing works for the two heat exchangers started subsequently. The deep seawater is obtained using either a 40in diameter intake pipeline or a 55in diameter pipeline. The pipes can supply up to 26,000gal a minute of cold seawater, equivalent to the warm surface water pumped for the facility each minute. The two heat exchangers have a 2MW thermal duty each, are between two and eight metres tall, and have a typical design seawater flow of 0.25m³ a second (4,000gal a minute). They were supplied by Lockheed Martin and are the first to use friction stir welding, a technique that reduces ocean corrosion. "The US Navy’s special engagement in the research centre is driven by its target of generating 50% of its shore-based energy from renewable sources by 2020." Makai will use the data from the plant to build larger plants ranging in capacity between 1MW and 100MW in the future. Makai, in collaboration with Lockheed Martin, has plans to develop 100MW OTEC plants for tropical island communities such as Hawaii and Guam. Lockheed Martin is further developing and constructing a 10MW OTEC pilot power plant off the coast of southern China in collaboration with Reignwood Group. The next plant for OTEC development at OERC is being considered by an international consortium comprising Japanese and US parties, as part of the Okinawa-Hawaii clean energy agreement signed in 2010. Specialist Heat Exchangers (SHE) is a market leader in the design, engineering and manufacture of bespoke air-cooled heat exchangers for the industrial, petrochemical and turbo-machinery sectors.